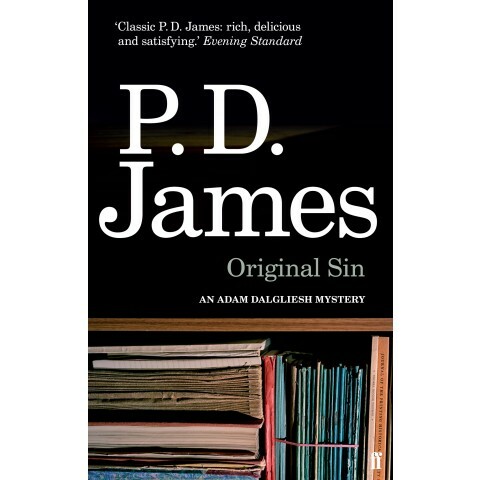 I am never disappointed when I pick up an Adam Dalgliesh mystery, I know what I will get with PD James: excellent plotting, thoughtful characterization, an impossible maze of clues, patient description and scene setting, and deep literary references. Original Sin delivers, and it also gives life to London and the River Thames. This is the ninth outing for James’ poet detective, Commander Dalgliesh, the taciturn, thoughtful, policeman with the stare which is as hard-as-nails. His colleagues respect him but cannot say they either know or like him. He is mysterious, and thereby hangs the fascination he holds for readers. The first death at Peverell Press, a traditional publishing house located in a Venetian-style house beside the Thames, is a suicide, the body found by a new employee. The same employee has the misfortune to find another dead body later in the book. There are a lot of dead bodies at Peverell Press, and there is also a prankster. Proofs wrongly amended, illustrations disappear, appointments cancelled. When the managing director, Gerard Etienne, is found dead of carbon monoxide poisoning, upstairs in the little archive room, the death is considered suspicious enough to call in the police. This is a complicated web of a story, James weaves together the current and back stories of the key Peverell employees, their alibis, their affairs and petty spats, their lies and secrets. Is the murderer and the prankster the same person, and what of the suicide? Is that connected? Essentially the building where Peverell Press is based, Innocent House, provides a closed-room mystery: the murderer must come from within the company but although some are haughty, others unlikeable and the rest just gossips, someone there must have done it. Did I guess? No. The motive is fascinating, though I could have done with a few more hints earlier on. Sandra, for some reason, when I received the notification that you had clicked on my post, I was unable to respond in any way. I had to google you and then get to this blog through your website. I’ll try to get back here more often, now that I know that. I’ll continue to try and keep in touch!